The EXL 100 was done by people who worked at Texas Instruments. It uses a lot of technologies of the TI CC40 (like the basic and the CPU for exemple). All the hardware is based on Texas Instruments chips. The TMS 7020 is the CPU, the TMS 7041 manages all I/O, the speech synthesizer (TMS 5220) and the infrared receiver. The keyboard and the joysticks are linked by infrared to the CPU. Several peripherals were developped for this computer : a dot matrix printer (EXL 80) and a modem (ExelModem). This computer didn't have a great market success. It was above all used in schools. 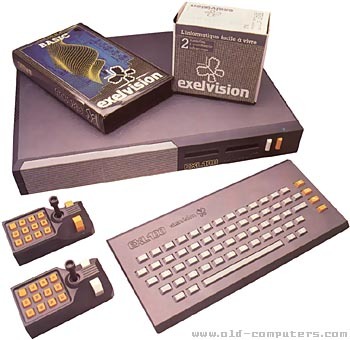 see more Exelvision EXL 100 Ebay auctions !